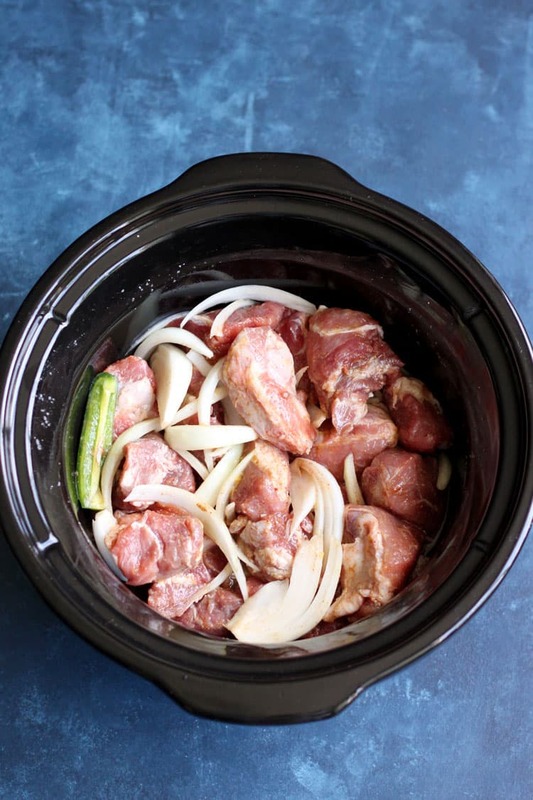 This recipe for slow cooker carnitas is so easy, you can make it in your sleep. It has been in our dinner rotation for years. You just need to chop up the ingredients, throw them in the slow cooker, set it and forget it. This recipe can easily be doubled or tripled if you plan to make it for a potluck or if you just want lots of left over for a busy week. 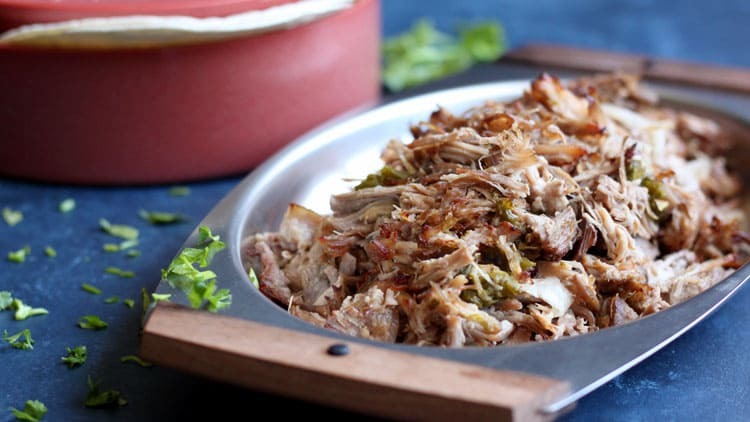 The best thing about this slow cooker carnitas is that you can serve it so many different ways. I have made this recipe countless time, and eaten it as tacos, quesadillas, enchiladas, you name it. Serve carnitas with warm tortillas for taco night, I prefer corn tortillas for tacos, but either corn or flour will do. Suggested condiments: homemade guacamole, salsa, lime, onion, and cilantro. Make a quesadilla, you’ll need large flour tortilla and cheese for this. I always use Mexican blend cheese. Suggested condiments: homemade guacamole, salsa, and sour cream. Use left over in enchilada filling, you’ll need corn tortillas, enchilada sauce (homemade or store bought), and lots of cheese. I make my filling with black olive, onion, and roasted jalapeño. But that is another recipe all on its own. Serve it with bean and rice for the simplest yet most satisfying meal. Make a torta (Mexican sandwich), you’ll need bread, usually bolillo or telera (a sort of Mexican baguette). Slice bread open, slather one side with guacamole, top with carnitas, shredded lettuce and tomato. 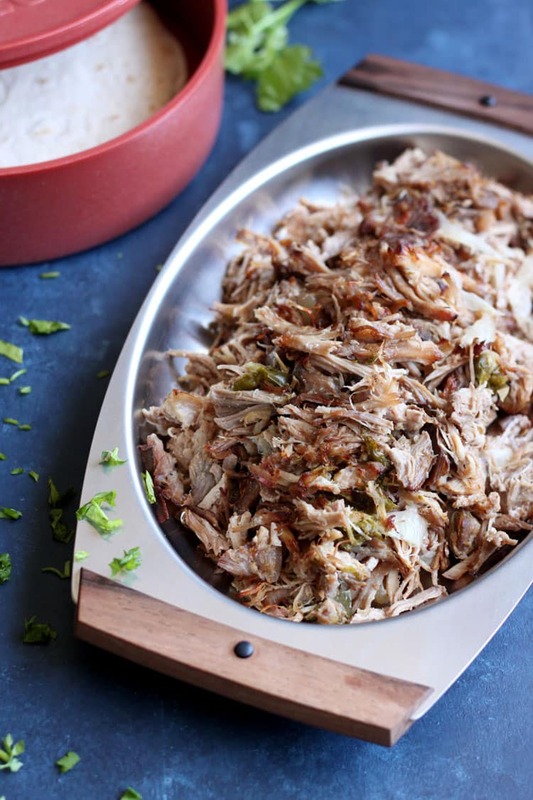 There is your meal plan for the entire week up there if you make enough carnitas. Slice the onion. Quarter and deseed the jalapeño. 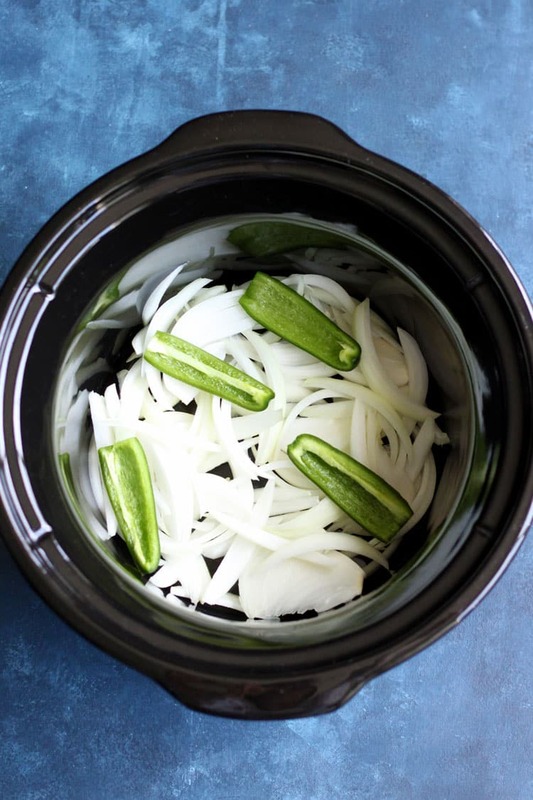 Add onion and jalapeño to the slow cooker. 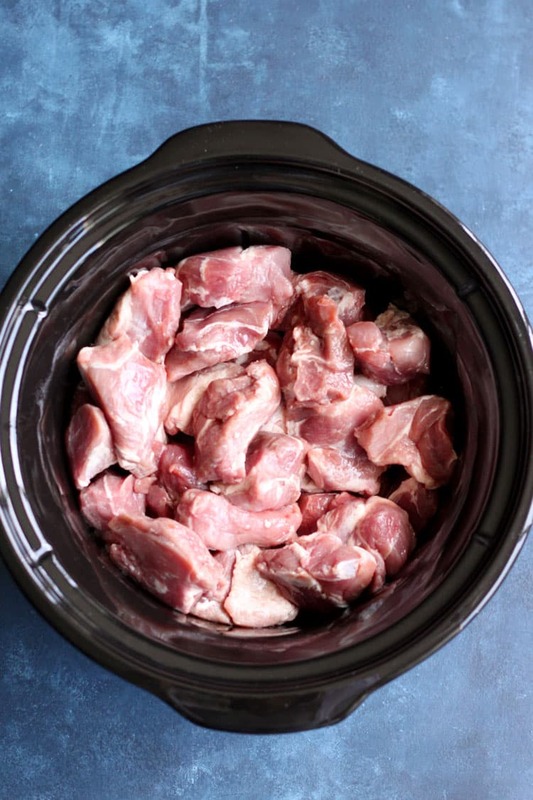 Rinse and dry the pork, cut into 1” to 2” chunks and add to the slow cooker. Add salt, cumin and cayenne pepper to the slow cooker and toss to cover the meat evenly. Juice the lime and orange, pour juice along with 1 cup of braising liquid over the seasoned meat. I used chicken stock. Cook on high for 5-6 hours, meat should be fork tender when ready. Transfer cooked meat with a slotted spoon to a glass baking dish. Shred with two forks. Put under the broiler for 5 - 10 minutes until golden brown and crispy. With some broiler, you may need to move the dish around during the duration to get even broiling. Serve with warm tortillas and salsa. 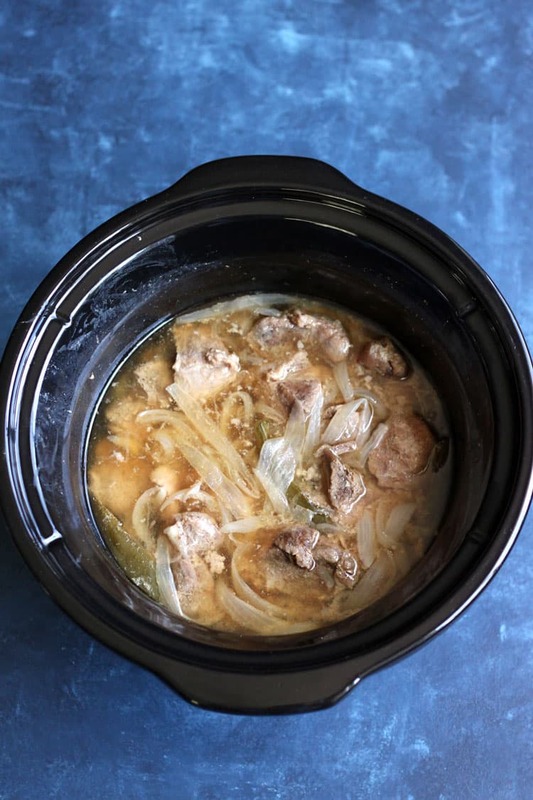 This recipe makes 4 servings under the assumption that each serving is 1/2 lb of meat. However, depending on your appetite, this may serve more or less people. It’s quite easy and fast, I should try for my family on tonight.